I don't know much about psychology, but I've heard about Sigmund Freud's structural model of the psyche, with the three part of the psychic apparatus. However, I couldn't really understand the parts. As far as I could understand it: the ego is the "everyday part" of self: our behaviour, personality and style we use in everyday events and interaction between other people. With this logic, the super-ego is just an "ideal"; a human model that we follow either if we want it or don't - and it often, since it depends on our wants, experiences, aims and fears. But id is something constant, that never changes, and contains our deepest feelings: fear, love, and instincts. Maybe even some hidden knowledges. So overall: ego is what we are, id is what we ACTUALLY are, and super ego is that what we want to be. Am I right? Or is it more complex? What exactly is meant by id, ego, and super-ego? The id is what we are born with, it is the mechanism that allows our basic needs to be met, and is with us from birth. Essentially, the part of the brain that 'cares' only about it's own satisfaction and needs. The ego meets the needs of the id, while taking into consideration the reality of the situation (e.g. needs of others). According to Freud, this is the strongest part, meeting the needs of the id, while not upsetting the superego. The superego is the moral part of our psyche, that deals with the ethical and moral constraints, i.e. belief in what is right and wrong. Edited to add: Further and more detailed information can be found included from page 5 in this article from the University of Notre Dame "Id, Ego, and Superego" (Lapsley and Stey). Please note that only the uppermost part of the self, the part labelled "pcpt-cs" (i.e. perception-consciousness, German Wachbewusstsein) constitutes our conscious thought. All three parts of the psychic apparatus are not conscious. 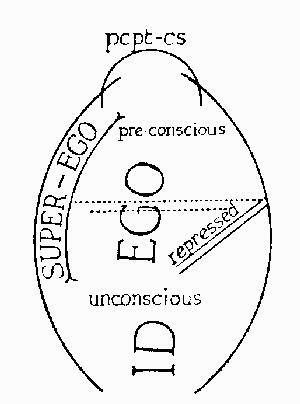 Some parts of the Ego and Super-Ego are preconscious and can potentially become conscious. The Id are your basic instinctual drives. The Ego tries to satisfy the needs of the Id according to what is realistically possible. The Super-Ego consists of your culture's moral rules as you have internalized them, mainly through the influence of your parents. Not the answer you're looking for? Browse other questions tagged cognitive-modeling psychoanalysis or ask your own question. What is the scientific definition of Introversion/Extroversion?